rebelling against your ordinary, everyday bakery. With a KNEADY dessert bar, you will never get sub-par taste that yields to "decor" first, as we proudly do not use any fondant, photo sugar paper, or poor-tasting frosting. All our frosting, candy-coating, and sprinkles are of the highest quality, but we still adhere to the code of "less is more" to ensure that TASTE is the highest priority. Most of our themed desserts and brunch items include minimal edible "decor" so that the integrity of the cookie/brownie/bar is not compromised. Along with minimal decor, treats can also be paired with a custom crafted "treat topper" with the logo/colors/photos of the event to make it even more personal and customized. See photos of past dessert bars and themed events HERE in our gallery. KNEADY is dripping with imagination to create your perfect themed event - shoot us an email at 2BakedGirls@kneadybakery.com to start brainstorming! Download KNEADY's CATERING DECK information packet for all the information you "knead"! 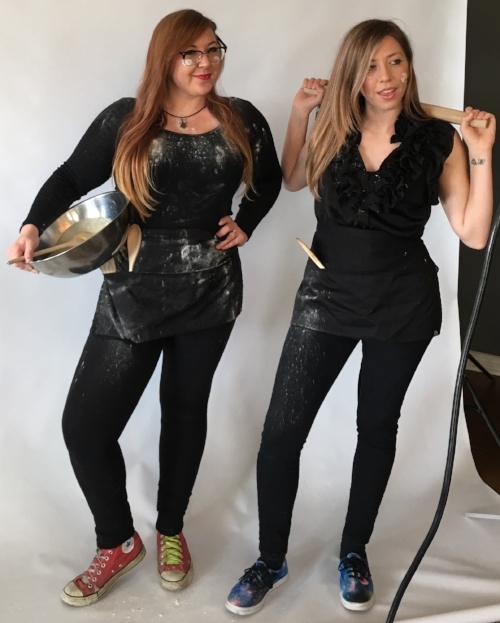 The 2 Baked Girls of KNEADY, LLC. (Kati and Ashley) personally create unique and original custom dessert and brunch bars for: Birthdays, Weddings, Showers, Kids' Parties, Corporate Events & Meetings, VIP Celebrity Galas, On-Set & Backstage Catering, Award Shows & After Parties, Fundraisers, Gifting Suites, Book Clubs, Brunches, and 'Enchantment Under the Sea' Rhythmic Ceremonial Rituals. FOR SMALLER, MORE PRIVATE EVENTS, OR FOR PERSONAL HANGOVERS OR MUNCHIE CRAVINGS, THE 2 BAKED GIRLS WILL PERSONALLY DELIVER ITEMS *BY-THE-DOZEN RIGHT TO YOUR DOOR WITH A 48 HOUR TURN-AROUND TIME. *(ONLINE BAKERY IS TEMPORARILY CLOSED. They ARE the nerds you're looking for. Any nerdy, geek-chic event - the 2 Baked Girls will theme the entire table to any fandom! There is no doubt that if you are hosting a nerdy event, you are Kneady's people, and they would be proud to serve on the Galactica with you. The 2 Baked Girls do NOT have a storefront location (yet! ), they rent commercial kitchen space, so every online order and catering event is made to order and does not include any added preservatives. Backstory on the girls, honestly? Kati and Ashley met freshman year of high school (doesn’t matter the year). They quickly became two best friends who cherished movies and pop-culture above all. They knew they wanted to start a business together, but they still wanted to be a part of the entertainment industry. When they discovered their random talent of baking, they thought of a way to merge that with their expertise in movie quoting. Thus, KNEADY was born. “Kati and Ashley are doing what?” - direct quote from all their family and friends. But then they turned out to be pretty good at it, so 5 years later here we are, what can ya do?